You can purchase your tickets on-line by visiting The Event Ticket Site at our website, or you can pay at the door. The cost is only $5 per adult and $3 per child. We hope to see you, along with your family and friends, at this event to enjoy breakfast and a day of meaningful volunteer work. Clean-up should wrap up around 3 PM. The efforts of all our volunteers will help our Growers make the transition from winter to spring/summer gardening activities. They need a little head start to get all the flower beds and vegetable boxes ready for the season. Hope Springs Farm is seeking sponsors and participants for their first annual golf tournament fundraiser being held on Friday, May 10 at the Manada Golf Course in Grantville, PA. Download the Event Flyer. All members of the community are invited to join together for a wonderful afternoon of fun, prizes, and food. The proceeds from the event will benefit the programs offered to all participants of Hope Springs Farm including community activities, animal therapy programs, gardening therapy programs, and cooking and crafting therapy programs. The Farm’s daily program participants are adults in the community who have intellectual, developmental disabilities, or Autism. This is a very exciting event to be a part of, as it is the first time the Farm will hold an event like this. Register a team using the FLYER or the website. You can sponsor one of the Prizes or be a Course Sponsor - download the Sponsor Flyer to learn more. 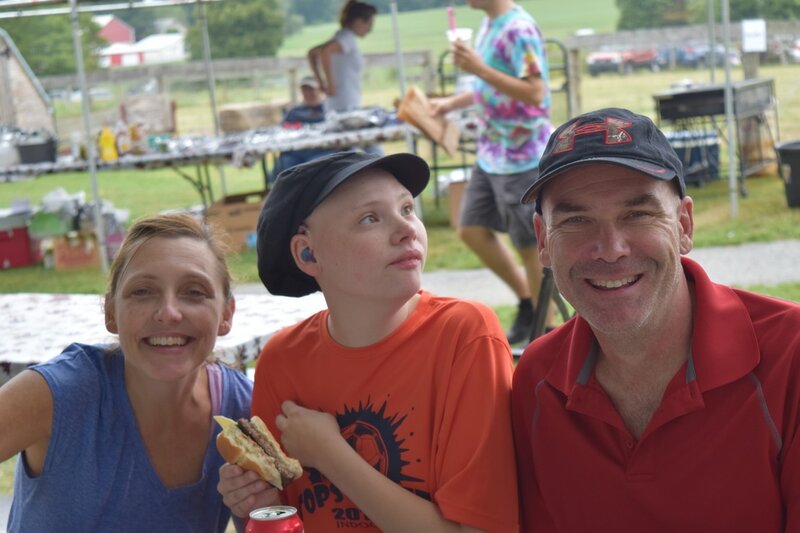 The mission of Hope Springs Farm is to provide adults who have intellectual and developmental disabilities as well as autism a meaningful day through joyful group activities within the community and on a family farm setting that lead to satisfying friendships. SHARING HOPE is a great way to double your giving impact in the local community. We ask donors to give to their favorite charity or organization through us. Read the FLYER or the rack card for more information. For example when someone donates $100 they can request we help the places like the Ronald McDonald House or some other local organizations and we make contact with the organization and find out what materials or supplies they need. The Growers go out and buy the items on their wish list and deliver them to the organization that day. This is why we called it SHARING HOPE, donors get to give to their favorite charity and they also SHARE their donation with the Growers in the form of a full day of community volunteer work for our Growers. Our Growers love to do this kind of volunteer work and it gives them a sense that the community needs them and they are valued. "Our Art, Our Voice" The ARC of Dauphin County 45th Annual Art Show - Call 717.920.2727 for entry forms. We are here to ensure all our adults have a meaningful day and improve their life in some way. You can be a part of that; you can help us change a life! We need lots of things here at the Farm. If you would like to donate something download our list. You can do your own fundraiser with your friends and raise the funds to get one of the items. Contact Jim to set up your very own Peer-to-Peer fundraising site. We also need volunteers to help out around the Farm. You can work with the Growers during the day, or you can help keep up with all the farm chores on the weekends.